Eveneer Alpikord is a range of new generation pre-finished timbers from Elton Group that combines the good looks of real timber with the versatility and practicality of laminate surfaces. Eveneer Alpikord pre-finished timbers recreate the authentic character of wood through natural textures and low gloss levels. Made from FSC certified reconstructed timber veneers, these timbers are supplied factory finished with high quality 2 pack polyurethane coats complete with UV inhibitors, laid onto a high pressure laminate back (3050 x 1300 mm or 2500 x 1250 mm), ready for the application. Eveneer Alpikord prefinished timbers reduce the effort involved in working with traditional timber, while also saving time, labour and costs. 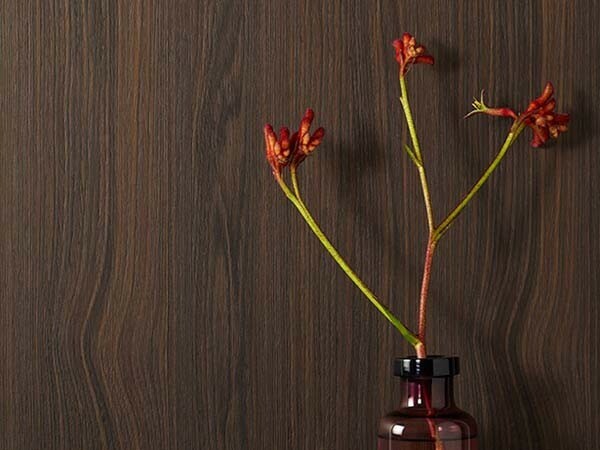 A grooved tactile effect, obtained by brushing the wood along the grain to emphasise its natural pores and materiality, this exclusive finish enhances the natural depth of the wood texture. Reproduces wood treated with wax and natural oils with a smooth, matt (5% gloss) surface. A traditional, refined finish with a brightness that recalls the look and feel of traditional furniture. A more durable finish – also available with IMO MED certified fire resistance.